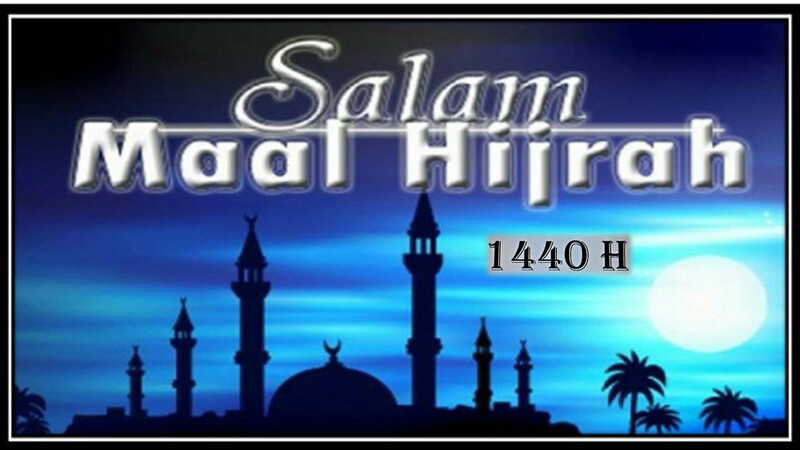 Today, 11 September 2018, is the start of the Islamic New Year – 1440 Hijrah, abbreviated as 1440 H.
Today, the first day of the first month of the year, Muharram, called Maal Hijrah, is a religious day of joy, enhancing compassion and humanity among all people as Prophet Muhammad, Peace Be Upon Him, came for all mankind (Qur’an, 21:107). Happy Islamic New Year 1440. Like all Islamic celebrations, the Islamic New Year celebration involves no wild merry-making like dancing and shouting or drowning oneself in ecstasy. Instead, all mosques in Singapore as well as across the world conduct two special prayers (solat sunat) at about sunset on 10 September 2018 (yesterday in Singapore): one, to leave the last day of 1439 H, and the other, after the obligatory Maghrib or after-sundown prayer (fourth prayer of the five obligatory payers of the day), to usher in the New Year, 1440 H. Following the lunar calendar, the Muslim day begins after sundown, not after mid-night. Roughly 14 centuries ago, an important event took place in Arabia – Prophet Muhammad, born and bred in Arabia was chosen by Allah (God) when he was 40 years old to be the last and final Prophet of Islam, the way of life or the Straight Way, that began in Paradise in its basic form with Adam and his wife, Eve, the first two human beings with the Advice and Instruction to obey Allah for righteous living. At one point in Paradise, Adam and Eve who had been instructed by God not to eat the fruit from a certain tree, disobeyed the instruction and ate it. But God, in His Merciful and Compassionate nature, pardoned their disobedience and they remained pure and sinless until the “ripe” or right time when they were placed on earth to start the human race. Adam became the first Prophet of Islam, at that time “Islam” was simply referred to as the “Straight Way, a religion of right” (Qur’an, 6:161). From the point of view of Islam, Prophet Muhammad, Peace Be Upon Him, as well as all the other prophets of Islam, 124,000 of them sent to all nations in the world (Qur’an, 10:47), including the well-known Prophet Abraham, Prophet Moses and Prophet Jesus (commonly known as Jesus Christ), Peace Be Upon Them All, who came to instruct people to believe in the One God and obey His Advice and Instructions for righteous living. The last of this long chain of prophets was Prophet Muhammad. He was the final or the “Seal of the prophets.” (Qur’an, 33:40), sent to complete the “Religion of right” (6:161) and to formally establish Islam (Qur’an, 5:4), a word suggesting peace, and carries the meaning “Submission to Allah”. As can be seen, Islam, in its essence, started from Paradise where Adam and his wife were nurtured and prepared for their earthly mission. This concept makes Islam neither a new religion nor founded by Prophet Muhammad but one that continued and developed from what the first prophet, Prophet Adam, and all the subsequent prophets, taught, till it reached its zenith and finality and given a name by God Himself – Islam (Qur’an, 5:4). This developmental stages of the “Straight Way” were necessary to prepare people for the totally developed stage – Islam, the stages of teachings from the first Prophet to the final Prophet being similar to the education system: simple to difficult, informal to formal, an example being the prayer: In the earlier stages, people prayed with any words they preferred and at any time, but in Islam, prayers became formal – there is specific time for the formal prayers, five times a day and with specific utterances taken from the Qur’an (Holy Book of Islam) and the Hadith (Sayings, Deeds and Examples of Prophet Muhammad) with the prayers being preceded by the wudhu (ablution taken to be clean in both body and soul) and that includes no shoes to be worn when praying. The Muslim prayer can be performed alone or with more than one, the larger the congregation the better to enhance friendship and humanity. 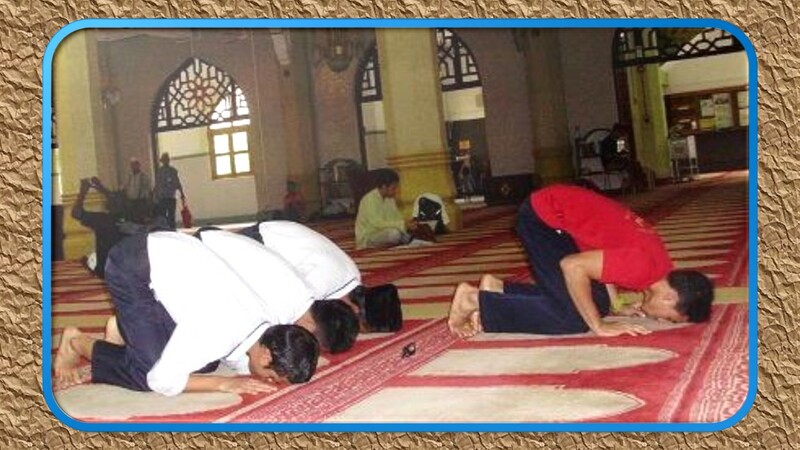 The prostration unit of the Muslim prayer, with the forehead touching on the floor, is the greatest humility shown to God. The migration of the Prophet from Mecca to Medina in the year 622 is a milestone event in Islamic history. It is a story of patience, endurance, striving and eventual triumph in the face of seemingly extreme hostility and hopelessness. The Prophet lived at a time when the pagan Arabs worshipped numerous deities; they indulged in intoxicants; they practised infanticide (killing of female babies); they treated women as mere chattels. This was their culture and way of living. Islam advocated the worship of the One God; prohibited intoxicants, banned infanticide, condemned superstition and gave women their rights. All these and other positive changes made the pagans feel that their culture and traditions were being destroyed by the teachings of Prophet Muhammad. However, there were some people who saw the beauty of the teachings and embraced Islam. This made the pagans turn on them. But the converts remained firm in their belief. The persecution of the Muslims then intensified. Many were tortured; many were killed. For 13 years, the Prophet carried on with his mission patiently, bearing all the agony and hardship of the persecution. At one point, for the safety of his growing number of followers, the Prophet sent some of them to Abyssinia (presently Ethiopia), a country whose devout Christian ruler, the Negus, gave them refuge on the basis that the fundamentals of his religion and those of the teachings of Prophet Muhammad were very similar; namely, that there is One God and that Jesus Christ was a great prophet born of a virgin. One day, in the year 621, some traders from Yathrib, an oasis town some 340km north of Mecca, came to the city. Having listened to the Prophet’s preaching, they embraced the religion. The following year, these same Yathribites returned, bringing another group of their fellow citizens. All pledged their loyalty to the Prophet. When they left, the Prophet sent with them one of his Companions to teach their fellow citizens back home the fundamentals of Islam. As a result, the Islamic teachings spread in Yathrib. The pagan Arabs became even more furious when they learned about the spread of the Islamic faith in Yathrib. They now threatened to kill the Prophet and his followers in Mecca. On the appointed night when the assassins burst into the Prophet’s room, they saw that the Prophet had already left his home unseen by anyone. Accompanied by his closest Companion, Abu Bakar, their destination was Yathrib. Horsemen were despatched immediately to hunt down the Prophet. Rewards were offered for his capture, dead or alive. Bounty hunters eagerly searched the deserts. Then, with the help of a camel guide, the Prophet and Abu Bakar started on the long and arduous journey across the burning, hostile desert, to Yathrib. The people of Yathrib welcomed him, with a large group of people singing the welcome song using tambourines to receive him, a song that has become famous and sung right to this day: “Ya Badrul Alayna”. This historic journey to a friendly and welcoming place was called the Hijrah (Migration). On 2 July of the year 622, the Prophet stepped onto the soil of Yathrib. This oasis town henceforth became known as Madinatul Nabi (City of the Prophet) or simply Medina (Madinah). The Islamic or the Hijrah calendar begins from this triumphant event, a date that changed the history of the world. After 10 years in Medina, the Prophet decided to visit his beloved Mecca, the place of his birth, then still in the hands of his enemies. With more than 10,000 Muslims and, with the Treaty of Hudaibiyah which allowed them to perform the Haj, Prophet Muhammad entered Mecca – without resistance or bloodshed. The Prophet freely forgave all his enemies. Many, including the enemy leader, Abu Sufiyan, embraced Islam on their own free will upon realising the compassion and beauty of Islam. People reading the Qur’an, the Holy Book of Muslims. The Hijrah is significant in the history of Islam because it highlights the accomplishment of a visionary goal for those who were God-fearing. It also signifies steadfastness, perseverance, progress and success. This entry was posted in Uncategorized and tagged Hijrah 1440, Islamic calendar, Muslim New Year, Prophet Muhammad. Bookmark the permalink.